I had leftover dates after making tamarind-date chutney, and I started thinking about different ways to use them in baking. Date scones came to mind, and I know I have a recipe for walnut date bars somewhere, but neither of those options were quite right. I was indecisive until I saw the banana-date tea cake recipe in Tartine . This was perfect. It’s a simple quick bread with lots of banana flavor, crunchy walnuts, and sweet, chewy dates. 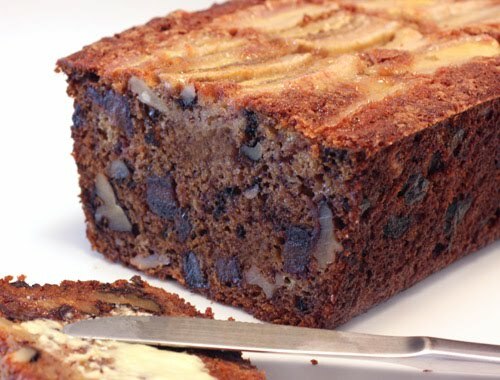 The batter is mixed, poured into a loaf pan, topped with long slices of banana, and that’s it. When I’m making use of a leftover, I feel like what it’s going into needs to be a simple preparation, and I had all the other ingredients for this on hand. Bananas were mashed and eggs and vanilla were added to them. Flour was sifted with cornstarch, cinnamon, baking powder, and baking soda. Butter was creamed with sugar, the banana mixture was added, and then the flour mixture was folded into the batter. Toasted and chopped walnuts were added with pitted and chopped dates. I use kitchen shears to cut dates in half, pick out the seeds, and then cut them into chunks. It seems easier to me to cut with shears since the dates are so sticky. 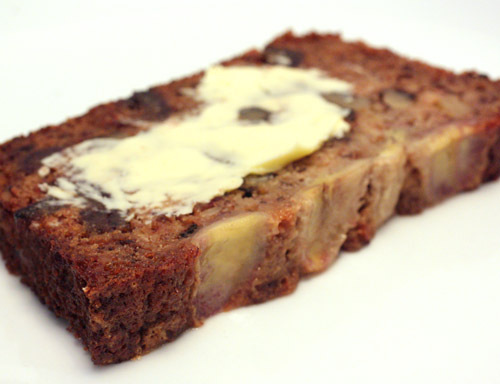 The finished batter was placed in a greased loaf pan, and then it was to be topped with full-length slices of banana. My banana broke in several places as I sliced it, so my slices were quartered rather than full-length. It was still pretty enough though, or so I thought. The banana slices were sprinkled with sugar, and the tea cake baked for a little over an hour until an inserted cake tester came out clean. This was a somewhat dense but very moist and flavorful tea cake. It sliced easily, and each piece was full of walnuts and dates. I stored the cake for an entire week in the refrigerator, slicing pieces for breakfast each morning, and it was as delicious on the last day as it was on the first. In fact, Kurt dropped a few hints about how there should always be a breakfast item like this in the refrigerator, and I think he’s right about that. I'm with Kurt too- there should always be something like that in the fridge! Looks great with the banana slices on top. Datenut bread is my favorite....but bananas are my kryptonite! I love these photos......makes you want to cut a slice! 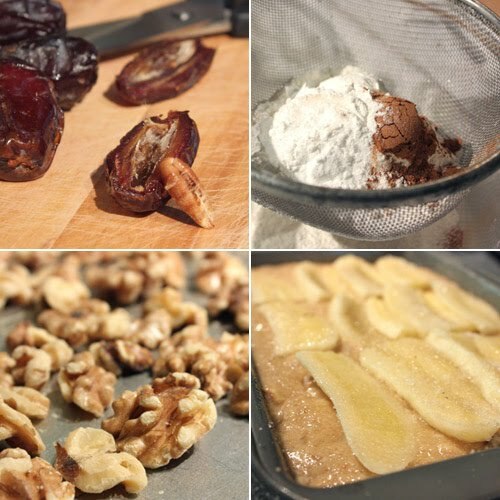 I love the Tartine cookbook and this recipe sounds like such a hit with the bananas and the dates. Wow. I love that they slice the bananas instead of mashing them. I agree with Kurt Lisa! If this were in my refrigerator right now I would be one very happy girl! It's loaded with some of my favorites and looks dense and moist just the way I like my breads. Wow this much be really rich and flavourful with the dates! Looks like a super way to use up your dates, Lisa! My dad used to love a date/apricot bar. It's gooey and delicious. Haven't made it in years. You are reminding me to try it again. Oh this looks delicious. I love how there are banana slices laid out on top! I bet this is delicious with figs, too. Dates are a fav from way back for me... This looks delicious and would go so beautifully with late morning coffee break...sigh. This banana cake looks so moist! I love this with a pot of hot tea! Oh Lisa, date and banana? It sure looks yummie, love how you layered the bananas...nice pictures! That is a beautiful tea cake!! I think you made the right decision using the shears....I love banana walnut, the dates would keep it extra moist. I love the sliced banana's make it look so cool when its cut! Perfectly moist and dense cake will be a good companion for tea or coffee. Lisa - This is the dark date walnut bread I grew up on, but could not find a recipe for. Every date walnut bread I tried was lacking the color and richness. I love the addition of bananas, and your photo of it captures every bit of moist, sweet heaven! What a lovely, rich & special banana, date & tea cake!! A good for you cake too! I love how the bananas are layered into the cake like that instead of mashed...it makes for such a lovely presentation! What an amalgam of flavors. Fantastic. Oh, yes! I suspect I could never go back to plain toast, bagel or even muffins after have a slice of this. Ahh yummy this cake looks delicious! Oh ! This looks luscious. I like the way the sliced bananas look after the cake was baked. The husband is going to love this.